Each doll comes with two standard glitzy outfits, hardly the habitual black robe or ritual gown, as you can see. Then there are the accoutrements: the spell book, the potions (sugar formulas to mix with water), the cauldron, stand, spoon stirrer and potion cups. At the top of the Mattell site, girls can link to get their horoscope in the spirit of the new Barbie theme. A TV commercial for the new doll opens by instructing girls to gather with their Secret Spells Barbies “at a secret time, in a secret place” to make these “secret spells.” Next you see young girls in a dark library mixing potions and making spells. One suspicious girl asks a more initiated friend, “Does it really work?” Right at that moment a young boy strolls into the group intent upon the girl who just cast the love spell on him. Does it work? You bet, and the girls all giggle and grin knowingly. All very imaginative, novel and innocent girl fun, some would say. The balanced child is not going to mix up a little white magic like this with what is truly evil. I would disagree. 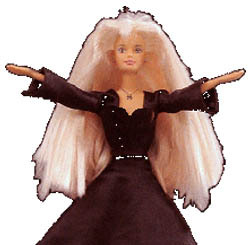 I have problems with the Wiccan Barbie for children, balanced or not, based on the same sound Catholic principles why I oppose the Harry Potter fetish. Secret Spells Barbie is, in my opinion, a very bad toy because it nourishes the tendencies – in an individual or society in general – to accept witchcraft and paganism as something that is not bad. It sends the message to a little girl that it is alright to play at sorcery, make spells, follow her horoscope, and dabble in a little magic. “As a 3rd generation pagan, I think that this is a wonderful idea! Kudos! I appreciate Mattel’s recognition of alternative spirituality. On the Witches’ Voice website, again, general agreement that while TV shows like Sabrina and Samantha or books like the Harry Potter series present a superficial picture of the real thing, they serve their purpose in awakening interest in witchcraft, which they proudly proclaim is “the fastest growing religion in America.” It is particularly on the rise among young people, especially high school and college-age females. It is girls that make up the majority of the 5,000 youth who have signed up on the Witches’ Voice “Teen Section” in the last 18 months seeking information or initiation. In fact, the younger generation has grown up with diluted images of magic and the occult. Their cartoons and toys feature ghosts, monsters, warlocks and witches. Most have access to the Internet, with its some 6000 pagan sites – some with special Pagan Teen Contact Sections so youth can chat, meet, and proselytize. Many talk about how their interest began with the Potter books or TV shows like Sabrina and Buffy. All this makes Wicca and the occult seem natural to them because they have been prepared tendencially to accept it as normal, as good, just another alternative entertainment. Such apparently innocent pastimes have the tendency to initiate a child or teenager into a kind of occult spirituality. What we are witnessing today is an environment that stimulates acceptance of something objectively wrong and evil - witchcraft and sorcery - as something normal and good. In this particular case, the adepts of modern paganism and the New Age revolution first aimed to create a spirit of tolerance for witchcraft. After this came the next step, which we are witnessing today. It has become something fashionable, the fad of the moment, like “punk” or “goth” was yesterday. The avant-garde and more sophisticated elements of society laugh at the old-fashioned conservatives who worry about children playing with ouija boards and casting a few spells. Relax, they say, it’s all just imaginative fun. I don’t have any problem with children having a little fun or exercising their imagination. The thing I don’t like is what their parents are swallowing in this case as they laugh, without even noticing it. I remember well my grade school Catechism class, where I learned that that superstition, fortune telling, spiritualism and magic were all evil and dangerous, sins against the 1st Commandment. Good Catholics didn’t even follow the horoscope readings, we were instructed. And we didn’t. The Catholic Church teaches that you cannot let your children experiment “playfully” with ouija boards, Dungeons and Dragons, séances, love potions, spells and hexes, or any other kind of charm. The spirits being “played” with are devils, pure and simple, not abstract concepts, but something real and effective. It is not the teaching, but the climate that has changed so much today, lamentably even inside the Church, where after Vatican II it became the style to trivialize such things. Catechism teachers stopped talking about the devil, who might “frighten” the children. Catholic schools began to celebrate “Halloween” as harmless, in lieu of the emphasis on All Saints’ Day. I remember in the 1970s some priests who jokingly took youth to haunted houses and held séances in cemeteries. The sense of fear and dread of playing with the spirit world diminished. 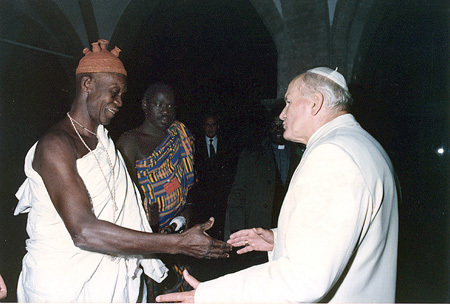 John Paul II greets an African voodoo "priest" at Assisi, 1985. After Vatican II and the innovations it generated, many progressivists began to question the reality of devils as persons and a physical place of punishment called Hell. Naturally, the false theory of universal salvation makes sense in an ecumenical climate where there is no Hell or devil, just alternative religions, which supposedly also lead to God. Voodooism and Spiritism do not appear so forbidding when their representatives are invited by the John Paul II to gather together to pray at Assisi. Yet this is the exact opposite of Gospel teaching, the Magisterium and the sensus Catholicus [Catholic sense]. 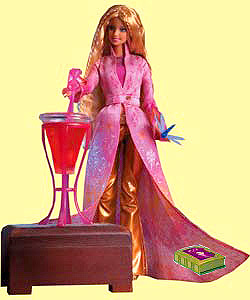 With this, I return to the Secret Spells Barbie. It is easy to see that the doll, which portrays witches as “magical enchantresses,” serves to acclimate girls to accept the idea that sorcery and witchcraft are not so evil or dangerous. The Wiccans themselves admit their “religion” and lifestyle is becoming more acceptable to teens because, even though a Sabrina or Secret Spells Barbie has very little to do with the actual practice of Wicca, they serve to mainstream the movement with their positive portrayals of young women practicing various forms of magic. To dismiss the Secret Spells Barbie and her Charm Girl friends as nothing serious is, in fact, to trivialize something very serious, very evil and very dangerous. My conclusion is practical: Do not allow your children to play with this kind of toy if you want to lead them to be good Catholics. 1. The process the revolution follows in the tendencies, ideas and facts is masterfully explained in “Chapter V: The Three Levels of the Revolution: In the Tendencies, the Ideas, and the Facts” of the celebrated work Revolution and Counter-Revolution by Plinio Corrêa de Oliveira, trans. 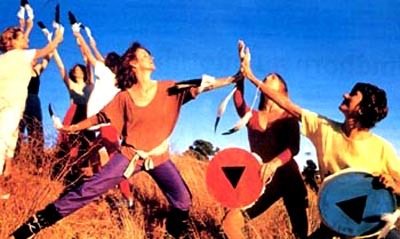 by M. T. Horvat, (Sao Paulo: Chevalerie Artes Graficas e Editora Ltd., 1993).